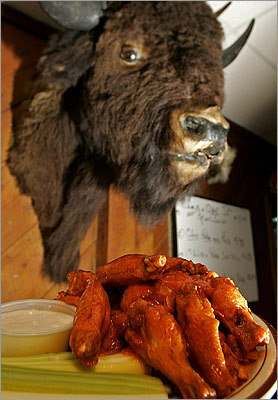 Under the watchful gaze of Buff the buffalo (pictured), these wings arrived rumored to be the Boston areas closest cousin to authentic Buffalo wings. That notoriety still didn't cause these Buffalonians to put Buff's atop their list, even with rave reviews. Very close to home, said Perla. Great size, crisp, nice sauce, perfect amount. Blum echoed Perla. "Pretty well lived up to the hype!"